Greetings from the 999 happy haunts. During Walt Disney World’s 40th Anniversary Celebrations, the Haunted Mansion was given its own party. Room For 1 More gave full justice to this iconic attraction with a sit-down dinner in Disney’s Contemporary Resort Fantasia Ballroom, entertainment by a spectral organist, singing graveyard musicians, and a one-of-a-kind presentation from Disney Imagineers ( Pete Carsillo, Eric Goodman, Jason Grandt and Jason Surrell) chronicling the development of the beloved dark ride. 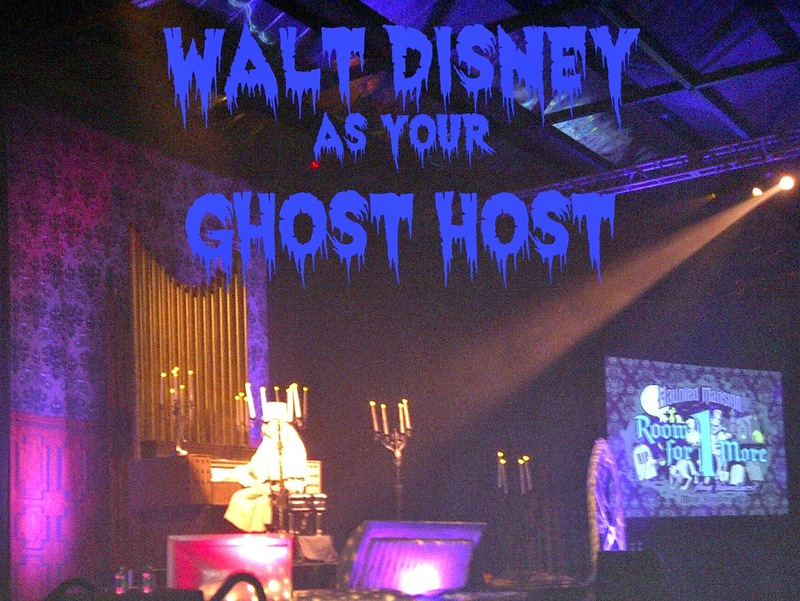 Nothing during our 3-hour event was more impactful than this 1965 clip from the master ghost host himself, Walt Disney. – Contrary to common lore, the Disney Imagineers present felt the Haunted Mansion was Walt’s last project, not Pirates of the Caribbean. – Haunted Mansion was built in 1963, but kept behind construction walls until 1969!! – Kurt Russell narrates a 1969 behind the scenes tour of WED Enterprises and explores Haunted Mansion special effects and Audio-Animatronics. He later takes some “pals” on a tour of the newly-opened Disneyland attraction. – Disney Imagineers began attraction development a full 10 years before its Disneyland opening. – Despite dramatic technological advances, “the original gags still work” and have not been changed. Happy Halloween fellow ghoul-lovers. Remember these Walt tidbits during your next Doom Buggy ride. The Haunted Mansion is one of my favorite attractions! I love it! I love hearing about project development straight from Disney Imagineers, but nothing beats hearing from Walt himself! Happy haunting to the Maguire Clan!! We love the Haunted Mansion! And now we know why Michelle- it was one of Walt's babies! Interesting stuff! Sounds like it was a great event! Just when you think you've heard all the Disney history anecdotes. I can't get enough Morgan! Very interesting! I love that Walt hand his own hand in the project. It makes it even more special!! Absolutely Deb- it's hard not to see each detail through Walt's eyes. Let's ride! I love learning more about the Haunted Mansion! Such a wonderful Disney attraction! Seems we can't get enough! Thank goodness some folks have long memories, and that Disney preserves all of its video footage. I adore the history of The Haunted Mansion. Jason Surrell's book covering it is incredible and a must read. I would have died and gone to heaven (pun intended) to attend this event. What an amazing experience! Lin, you have shamed me into finally reading Jason's book- thank you for the review!